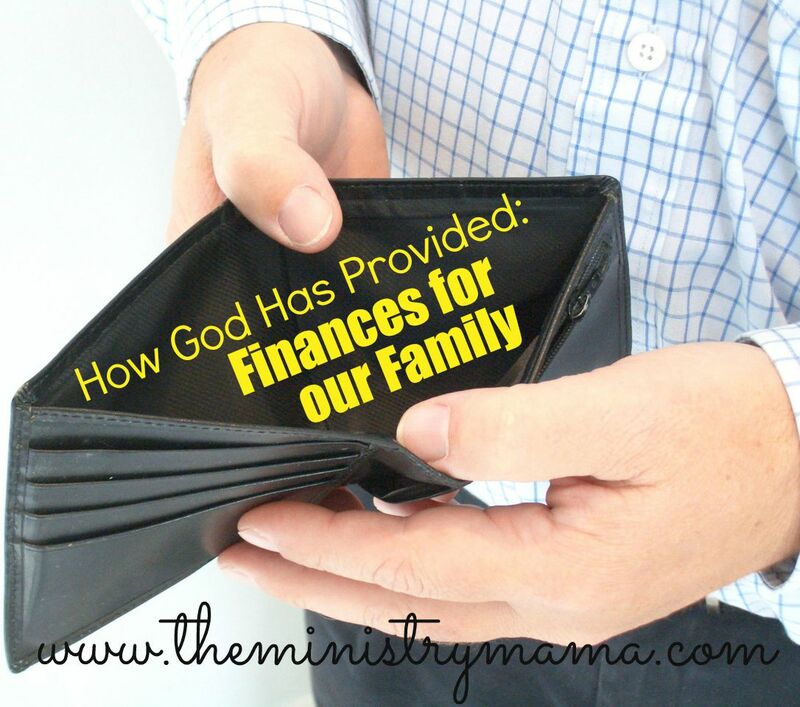 Almost eight weeks ago we stepped out in faith to follow my husband’s calling to preach and it has amazed us to watch how God has provided finances for our family now we are completely dependent upon Him. Our situation reminds me of the Biblical account of Elijah, when there was a famine in the land God directed Elijah to a specific place where God Himself would be his sole provider. The Lord has decided not to provide for us using ravens to bring us bread and meat but He is providing faithfully each day in other ways. When we left our church we received a check from our church as well as a love offering from both the members and the choir that served beside my husband for the past five years. My husband has preached so far in 5 different churches and all of them has provided him with a love offering to cover our expenses for our travels there. One church even generously gave us $1,000 to be a blessing to a young preacher and his family, we were humbled by their generosity and kindness. Before our last service at our church a couple approached my husband about helping us take care of some repairs that our van needed since they knew we would be on the road. They gave us $1,200 toward our repairs and the rest of the money that we needed was the exact amount that our church members gave us in their love offering. We spent 6 weeks on the road in a van that was fixed and back to its best self, until we backed into a dumpster and broke a tail light! Whoops! Another very humbling gift was from a couple that gave my husband a handful of cash who we had never met before. Later we were able to pull all the connections together and find out that this couple had buried their 2-year-old son who had died from cancer only one week before. Their gift was precious to us. Friends of our on a fixed income gave us a check from their family business, not once but twice. We know they probably could have used it for themselves, but they gave. Three different family members provided us with checks that covered our expenses for one month. We made a stop to see family friends and they also gave us a check to be a blessing. We not only received monetary gifts, God provided us with many paid meals as well as accommodations in each place we visited to take care of us as we stayed overnight. Although they are not cash in hand, they are financial needs met. Early in the spring we made a choice to begin experimenting with buying items in lots and reselling them. We bought a 16-tub lot of vintage toys from the ’90’s and early ’00’s, books from library book sales, and a very large homeschool curriculum bundle. Although we have been selling throughout the year, our sales have been thorough and steady enough to provide what we need to be able to save for any upcoming needs, like our baby due in September! This has also kept us busy in what might normally be considered a downtime between ministries. We have needed to be busy since we do not know the will of the Lord for our lives yet, it gives us purpose to be able to provide for our family with the work of our own hands. When we have not been on the road we have been busy taking pictures, listing and shipping items and then waiting for the Lord to sell them for us. And really with some of the random items that we have, it has had to be the Lord selling them for us! God was showing us some things in our previous ministry that were telling us it was time for us to truly take a step of faith and leave what we were doing and we did it. When we made the choice we knew that it would end my husband’s income, our housing allowance, and other expenses like car insurance that his job provided. God is showing Himself faithful. We have heard many stories in our travels of God taking care of families for up to 7 months or more when they took their own step of faith to wait on knowing where the Lord would direct them next and trust He will do the same for us if that is what He desires. Not only did he provide for us monetarily, as we traveled in Arizona, New Mexico, Texas, Oklahoma, and Kansas and spent time with our family and ministry friends which has been as much of a blessing as any monetary gift we have received. We needed time to get away and fill our cups with the ones we love. We’ve needed to sit under preaching without ministering and let our kids build relationships with their cousins and other ministry kids. Not all of our needs have been financial but I can testify that if the Lord calls you to follow Him, then He will give to you along the way. It may not be everything you want, but it will be everything you need! And for us, when the brook dries up and these things no longer provide for us, then we know the Lord will lead us on to the next place of His provision. Psalm 68:19 Blessed be the Lord, who daily loadeth us with benefits, even the God of our salvation. Selah. As a ministry mama, I don’t work, I stay home with our four kiddos and my schedule stays full as it is. Sometimes I really want to do more to make money for our family so we can update a few things here and there but every avenue that I have attempted at home has left me with expending too much time, neglecting the kids, and getting little in return. So, I have come to grips with the fact that God does not want me to work even in doing something from home so I have also accepted that at this time I cannot be the one to add to our bank account. So, God does it for me! A friend of mine works at Trader Joe’s and received some meat, and she was so kind to share some of it with our family. It was a simple gift from heaven, a few texts, and a knock on the door. Simple delivery. I love when God’s gifts are so quick and obvious! So, as God filled our freezer He also provides for our finances. The meat added up to around $96.00. We will be able to save money in our groceries now and maybe we won’t get to replace some of the things I would like to, it may just buy some new shoes for the kids or something like that. We never seem to run out of needs and God never stops running out of solutions to provide for them. He’s a good God that loves us so tenderly. I am so thankful that I am His child!